Please remember that the Round Table will continue to meet in the Mural Room at the Scottish Rite Hall in Lake Worth, 2000 North D Street, Lake Worth 33460, at 7:00 PM on the second Wednesday of the month. The first two meetings at our new location went extremely well. The management at the Scottish Hall has been very cordial and helpful. The Round Table is fortunate to have such a great new meeting place that is centrally located. The Mural Room is quite large and we will be using a microphone at all future meetings. Thank you to Monroe Ackerman for bringing his coffee urn, coffee, cups, sugar, and creamer. He has made the coffee at the last two meetings. We need others to volunteer on the "Reasonable Grounds" committee to insure that the coffee is made at each meeting. Any assistance that members can offer will be greatly appreciated. We are expected to return the room the way we found it after every meeting. Kindly remove any trash at the tables to the bins in the rear and return the tables and chairs to their original positions. Some people walked out the door at the last meeting without making any effort to help. If everyone does their part, the cleanup will be much quicker and easier. Raffle tickets will be sold before the meeting begins. Books in good condition from any historical era will now be accepted for the raffle. Remember to bring in your book donations. Several people have returned books they won in the raffle to be "recycled!" Thank you to everyone who brought refreshments, especially those who brought in food who were not scheduled to do so. Everything was delicious including those homemade sandwiches at the last meeting. All your efforts were greatly appreciated. The "Forage List" will be passed around at all meetings. Every member is asked to bring in refreshments once a year. Mary Ellen Prior will give you a reminder call a few days before the meeting. The Round Table is in need of a program chairperson or committee. Part I: During the Civil War many women, usually Catholic nuns, cared for the ill and wounded at great personal risk. Why did they do it? Part II: When the Articles of Surrender were copied to be bound into pamphlets at Appomattox, the man entrusted with this task was Ely Parker, a Seneca Indian. General Lee referred to him as a "real American." What kind of man was Ely Parker? Janell, a native of Atlanta, Georgia, graduated from Emory University with a Bachelor’s Degree and a Master’s Degree in Spanish and French. Additional graduate studies were done at the University of Mexico and the University of Valencia. Janell’s great great granddfather, Charles James McDonald, was Governor of Georgia between 1839 and 1843. During the Civil War, when Sherman’s army marched through Georgia, Sherman told his soldiers to spare the McDonald home, which they did. Unfortunately, stragglers later burned the home to the ground. After a career as an English teacher, Ms Adair, became interested in the genealogy of her husband’s ancestors. Her first book (from which the pictures in this report are taken) was a straight genealogy, The Descendants of Benjamin Adair,. She then wrote An American Odyssey, a biography (in novel form based on meticulous research) of the life of Benjamin Adair, Jr. (1796-1870), her husband’s great-great-great-grandfather (hereafter "Ben"). The story portrays a family that "represented the true pioneers of the early to mid-nineteenth century in America." The odyssey begins in 1770 when the patriarch, Benjamin Adair, Sr. (hereafter "Ben, Sr."), landed in Baltimore, Maryland, from Northern Ireland. Both Ben, Sr., and Ben practiced pioneer virtues, hard work, thrift, honesty and patriotism. The Adair family participated in all of our wars, beginning with the Revolutionary War. Ben took his family first to Virginia, then to Ohio, then to Indiana and finally to Olathe, Kansas, in 1857. Her talk involved many Adair relatives, since the family was prolific, and tried hard to keep the various relationships straight. Ms Adair pointed out that slavery had been a problem for America from even before the Revolution. The balance between its protectors and its enemies was tenuous. Northerners helped slaves escape via the "underground railroad" and Southern bounty hunters grabbed blacks off the streets of Northern cities, often without regard for their actual status as free or slave. The Kansas-Nebraska Act of 1854 was designed to "quiet" the conflict but actually exacerbated it. Sen. Douglas’ "Popular Sovereignty" was intended to let the residents of Kansas Territory decide the slavery issue for themselves. Pro-slavery "Bushwhackers" promptly invaded Kansas and killed and burned out free-state settlers. Abolitionist "Jayhawkers" retaliated in kind. In March 1855, the Territory voted for slavery in an election marred by violence and fraud (twice as many votes were counted for slavery as there were registered voters)! Ben’s nephew, Samuel Adair (hereafter "Samuel"), was a Congregationalist minister in Ohio. Samuel had attended Oberlin College and married Florella ("Ella" Brown, a graduate of Oberlin, then as now a very progressive institution. Samuel took his new wife from a life of ease to live in a windowless sod-roofed timber 360 square foot cabin. In Indian, "Kansas" means "South Wind," and the name was appropriate – sweltering summers, violent storms and bitterly cold winters, droughts and wildfires. Ella gave birth to three children, but lost her fourth as a baby and returned to her parents’ home with two of the children in August 1860. To her family, she looked "old" at 43 and her children were five years’ behind children of the same age in Ohio. At Samuel’s pleading, she returned to Kansas, only to die February 6, 1865, age 48. Ella’s half-brother was that John Brown, a rabid abolitionist, who moved to Kansas in 1856 to visit her and stayed to participate in the violence that became known as "Bloody Kansas." In retaliation for the sack of pro free-state Lawrence on May 21, 1856, and the nearly fatal attack on Sen. Charles Sumner by Sen. Preston Brooks on the floor of the U. S. Senate, on May 24, 1856, John Brown and his sons killed five pro-slavery men with broadswords in the "Pottawatomie Massacre." The name "Adair" was so hated in Kansas that Samuel advised Benjamin’s father not to send him mail addressed to Samuel Adair but instead to use "Samuel Lyle." On June 2, 1856, in what came to be called the "first battle of the Civil War," Brown’s force defeated and captured Henry Pate and his men, who had sacked Lawrence, and exchanged them for Brown’s sons. On August 30, 1856, Brown’s men prevented proslavery forces from sacking Osawatomie. In revenge, "Border Ruffians" killed John Brown’s son, Frederick, and David Garrison, near Samuel’s cabin. 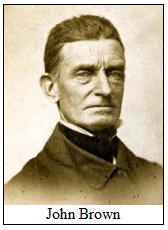 Ms Adair noted that after Brown’s attack on the Harper’s Ferry arsenal failed and he was about to be executed, his last, prescient, words were, "I, John Brown, am now quite certain that the crimes of this guilty land will never be purged away but with blood." Spurred by the decision of his son, Thomas Adair (hereafter "Thomas") to move to Kansas to help the anti-slavery cause, Ben, then 61, and his wife, Ann, then 55, and their children, Thomas, then 31, and three younger Adairs, along with Thomas’ cousin, Lewis McMillen, and neighbors, John McKaig and Jerome Seward, left Indiana in February 1857, arriving in Olathe, Kansas on March 16, 1857. Olathe was about 30 miles North of Samuel’s home in Osawatomie. One day, while they were away, the Adair homestead was attacked by Bushwhackers, who killed their horse and cattle and stole most of their food. In May 1858, Thomas and cousin Lewis McMillen witnessed an attack by Bushwhackers that killed five and wounded five free state settlers. 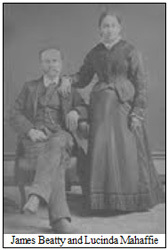 In October 1857, J. Beatty Mahaffie (hereafter "Beatty") and his wife (Ben’s niece), Lucinda Henderson Mahaffie, and their children arrived in Olathe from Indiana. Beatty was a good businessman and quickly realized the opportunity presented by the many stages and wagon trains passing Olathe on their way to and from the Santa Fe or California Trails. Beattie arranged to have the stage coach companies make his farm a scheduled stop. Starting with a small kitchen, outdoor tables and an area for tents, by 1865 Beatty had built a stone house with indoor dining rooms and bedrooms. Beattie was clever enough to avoid being labeled either a "free-stater" or "proslavery." As a result, when raiders from either side came, Lucinda fed them and gave them whatever supplies they demanded, and thus escaped being burned out or killed. Beatty was careful to avoid contacts with Samuel or Ben, lest his profitable "neutrality" be lost. In 1860, Thomas, cousin James McMillen and brother-in-law Charles Brandt all participated in the Pike’s Peak Gold Rush. They found some gold, but only enough to pay their way back home! Kansas entered the Union as a free state on January 29, 1861. The advent of the Civil War meant more violence in Kansas: William Quantrill’s raiders, including "Bloody Bill" Anderson and the Younger and James brothers, sacked Olathe in September 1862, killing three civilians and two young recruits who had just enlisted in the 12th Kansas Infantry. In 1863, Quantrill’s men killed 180 men and boys in Lawrence, Kansas. The Adair extended family sent 13 young men to fight, 12 for the Union and one for the Confederacy. Four McMillen brothers served in Indiana regiments. James McMillen joined the 3rd Indiana Infantry, which was organized on April 19, 1861, and was the first regiment to be organized on either side. After the soldiers’ 90 day enlistments expired, the 3rd Indiana was reconstituted as the 9th Indiana Infantry, This outfit gained the nickname the "Bloody Ninth" after it fought at Philippi, Shiloh, Stone’s River, Chickamauga, Chattanooga, Atlanta, and Nashville. In July 1862, Quincy Adams McMillen died of disease. Thomas Jefferson McMillen served as an Assistant Surgeon in the Union army’s field hospital at Shiloh. There he treated a wounded soldier he thought he recognized. It turned out to be Corp. Addison Lyle Adair, 78th Ohio Infantry, a cousin! Ben’s nephews, John Adair, Austin Adair and William Addison Lyle Adair, also served in the Bloody Ninth. Samuel’s son, Charles Storrs Adair, enlisted in the 2nd Kansas Infantry. 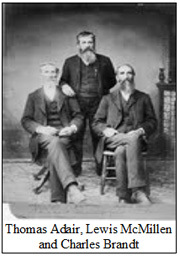 In the summer of 1862, two of Ben’s three sons enlisted: Thomas joined the 10th Kansas Infantry, while Benjamin Franklin Adair ("Frank") was an officer in the U. S. Kansas 2nd Regiment Indian Home Guard, one of the few white officers who led Indian troops. Frank lived until 1901. Ms Adair focused on July 1-4, 1863, pointing out that Ben’s nephew, Austin Adair, fought under Grant at Shiloh, was given a battle field promotion to sergeant, and was at Vicksburg when it surrendered. Ben’s rebel nephew, Hugh Franklin Lyle, enlisted in the 11th Virginia Infantry Regiment, fought in First Manassas and participated in Pickett’s Charge at Gettysburg. Finally, Francis Asbury Adair, Austin’s father, and scores of other middle-aged men, mustered into the 110th Indiana Infantry to defend Indiana against Morgan’s "invasion" (which ended up with his capture in Ohio). 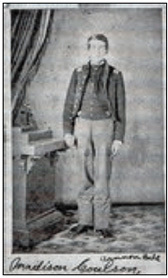 Madison M. Coulson, Charles Brandt’s first cousin enlisted in the Indiana 9th Regiment and rose through the ranks to be 1st Lt. He fought at Philipi, Laurel Hill, Carracks Ford and, finally, Shiloh. He transferred to the 2nd Brigade, 2nd Division, 19th Corps, Army of the Cumberland, and fought at Stone’s River. He brought home with him a "James" artillery shell, pictured at right, as a souvenir. Even survivors might die young as a result of their war experiences. Madison died April 3, 1869. Thomas Jefferson McMillen died in 1875, aged 38. Ms Adair then focused on Ben’s son, Thomas Adair, who had enlisted in the 10th Kansas Infantry and then resigned to join the 83rd U. S. Colored Infantry, part of the 2nd Kansas Colored Regiment. As in the movie, Glory, Thomas was a white officer who led a black regiment. His name is on the African American Civil War Monument in Washington, D. C. The battle of Jenkin’s Ferry, in Grant County, Arkansas, on April 30, 1864, was a successful but bloody rear-guard action, part of the failed Union Red River Campaign. Thomas’ men charged, shouting "Remember Poison Springs," where rebel soldiers had killed African-American soldiers who were wounded or trying to surrender. After the fighting ended, some black soldiers of the 2nd Kansas Colored regiment shot and killed Confederate wounded in retaliation for the killing at the battles of Poison Springs and Marks’ Mill. The large caliber, low velocity bullets expanded within the body and shattered bones. Gut shots were almost always fatal due to infection. Corpses often had their clothing torn because the men tore at their clothes to see if they had a gut shot fatal wound. As would be the case in later wars, tactics had not caught up with improved weaponry: men marched abreast across field toward men in rows firing at them. Since many regiments were organized from the same town or village, a town’s or village’s entire generation could be destroyed in five minutes! At least 600,000 young men died in this war. Ms Adair concluded by pointing out that the Civil War was a defining event in our nation’s history. As historian Shelby Foote states, it changed the way we speak of the United States from "are" to "is." Ms Adair then fielded several questions before receiving her well-earned applause.